If you grew up in the 80s or early 90s, it’s pretty likely you’ve seen (and loved) The Princess Bride. I remember visiting my cousins in Washington State for a week when I was a kid, and one afternoon they suggested we watch it. One of my character flaws is that I’m inclined to believe I won’t like any movie or show before watching it, and I was pretty sure I wouldn’t like this one. Nevertheless, everyone else’s enthusiasm won out and we piled into my aunt and uncle’s master bedroom and popped in the VHS. And, of course, I loved the movie and, like probably millions of other families, it became part of our family lexicon (when my dad gave my graduation speech, it included multiple lines from The Princess Bride). So when my sister Landen mentioned that she was reading As You Wish about the making of The Princess Bride, written by Cary Elwes who plays Wesley, I was immediately interested. And she also mentioned that, although she was reading a print copy, she’d heard the audiobook was stellar and read by a bunch of the cast members. Obviously, I had to get my hands on an audio version. I snagged a free trial from Audiobooks.com (and then promptly canceled my account because . . . that’s what Overdrive is for). And. . .it was everything I’d hoped for. (Bart asked me last week as I was listening while putting on my makeup, “Is it actually that interesting?” Yes. Yes, it is). I’m inclined to like behind-the-scenes things anyway, but this book was just extra delightful. It’s so charming to hear Cary (why yes, of course we’re on a first-name basis) tell about his experiences from being cast all the way through filming and then into the cult classic the movie became. Most of the memories of the cast members are read by those cast members (the best of all being Wallace Shawn who always sounds exactly like his character in the Princess Bride, saying “Inconceivable!”) and it’s just FUN. Cary describes making the movie as just a purely fantastic experience for everyone and you really get that sense in the book. When they were filming the final kiss at the end of shooting, the director told them they got it right on the first take. But both Cary and Robin (who plays Buttercup) insisted they thought it needed to be done over again and then again and they ended up shooting it six times. They both said they just didn’t want the filming to be over and to have to admit that their parts were over (I’m sure the kissing wasn’t so bad either). And then there are just so many fun little details that make me excited to watch the movie again. Like that scene where the six-fingered man knocks out Wesley when he and Buttercup emerge from the fire swamp? They were having a heck of a time filming that to look realistic, so Cary finally suggested he just gently tap the sword on his head for real. The sword was an actual sword, not just a plastic one, and when the six-fingered man did it, he accidentally hit him too hard and Cary actually was knocked unconscious. And . . .that’s the take they used in the movie. Or when they filmed the scene with Miracle Max and Wesley is mostly dead on the table, Billy Crystal was so hilarious, ad-libbing jokes, that they had to replace Wesley with a rubber doll lookalike because Cary couldn’t stop laughing at how funny Billy Crystal was. I love it when I’m reading a book that I can recommend to practically everyone, and this is one of them. If you’ve talked to me in the past two weeks, I’ve probably told you about this book. And really, you should listen to it. It’s one of those books that I just think has GOT to be better listened to than read (but . . . I only listened, so I can’t actually say). Ahhhhh! I can't wait to find the audio and listen! Best. Movie. Ever. My husband and I quote it randomly and for no reason at all! 🙂 It's just one of those kinds of movies where it just never gets old! I just read it last week (not so into audio books), and I particularly like the stuff about Andre the Giant. It was such a nice book, you know? Everything he had to say about the cast and crew was complimentary, which is a nice change. Also, when I was telling my husband some of the stories about Andre the Giant, my older son was of course intrigued, so I showed him the wrestling scene between Westley and Fezzik. And then we watched the swordfight scene with Inigo Montoya. And then I let him watch the first half hour of the movie in little bits. Most of the dialogue is over his five-year-old head, and I'm not going to let him watch enough to get to the torture scenes, but in general, it's amazingly inoffensive for children. Hooray. I just finished "The Princess Bride" so I'm so glad this one was so wonderful! I must see if my library has an audio version! once again, sold! sounds so fun! Ha, this book looks hilarious! It's so nice to know that the actors had as much fun making the movie as it looks like they did. So happy to know that we were the ones who infected you with the "Princess Bride" bug…although I don't remember the experience you described even a little bit. 🙂 I'll have to check this out- I'm a serious fan. The book is full of wonderful behind-the-scenes stories that are bound to wow any fan. The printed edition has photographs from Reiner and Norman Lear's personal collections, plus plenty of set secrets and very funny tales backstage tales which will keep any fan in stitches. 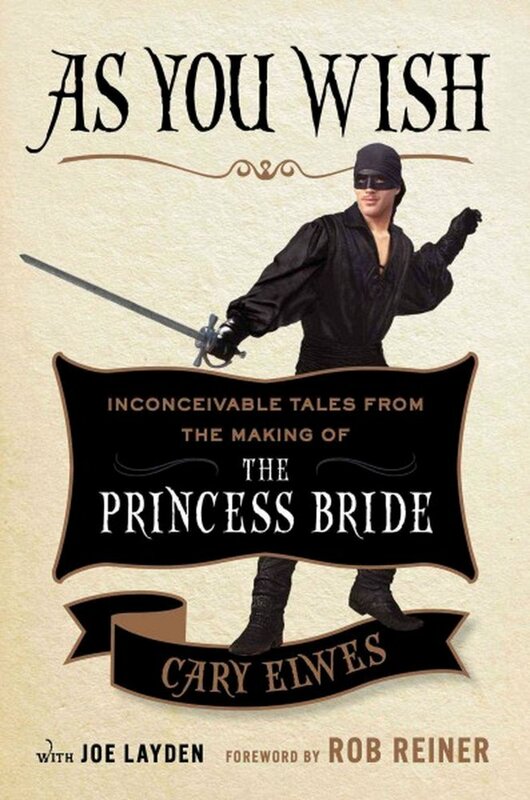 This book is an absolute must have for any Princess Bride fan, and a should have for everyone else! Just saw that Cary Elwes is visiting Flyleaf in Chapel Hill for a Q&A and book signing in May!